My main transceiver is an Icom IC-775DSP and my second transceiver is an Icom IC-736. I have one of the first Acom 2000A amplifiers sold in the US. This is a fantastic amplifier! Computer automation is a hallmark of the K3PP station and one of my favorite discoveries to this end is the GYT Special, a cheap and simple computer interface designed by WA3GYT (now K3PH). The station is currently in a bit of disarray, having fallen victim to neglect over the past few years. I've been too busy to play much radio and the maintenance needed to keep everything in tip-top shape has not been done. I'm now working hard to bring it back to competition-grade. I recently bought a RigBlaster "plug & play" for the digital modes. It's a very nice unit that takes care of all rig control, sound board interfacing, PTT, and CW keying. It uses a USB port and includes a driver to emulate a COM port for all those software packages looking for a COM port. It's a bit tricky to get the CW keying, PTT, and rig control all working with some software packages, but it's good to have it all in one little package and one that works with USB. The new computers no longer provide COM ports, so a lot of existing interfaces will no longer work without additional gadgets and drivers. 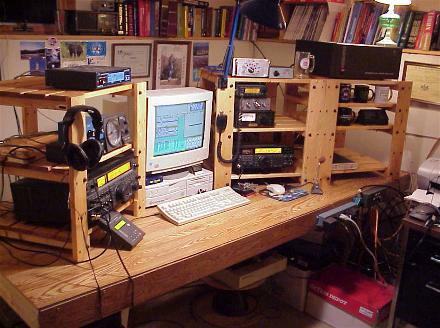 I originally used a PK-232 for RTTY operation. I wired up the PK-232 to the IC-775DSP for direct FSK. The DSP in the 775 results in phenomenal RTTY performance! I have my station layout arranged for efficient Single-Op Two-Radio (SO2R) operation. The shelves on the operating desk are from IKEA, a Swedish furniture retailer with a store near Philadelphia. This photo is now quite old. I need to snap a new one, but I need to clean it up significantly! In addition to some new equipment, the computer has changed. The old clunker shown here died a long time ago and was replaced by a new Compaq machine running Windows XP. It has multiple COM ports for control and dual monitors. In keeping with my growing interest in DXing and radio contesting, I built a 69 ft radio tower several years ago, topped with monoband yagis for 10, 15, and 20 meters. The tower and antennas work beautifully! I'm able to beat out many other stations, although the 10m antenna is actually too high. I need to optimize my antennas for the other HF bands and, at some point, plant another tower or two. On 40 meters, I use a dipole at 40 ft. I have a 75m dipole at 50 ft. and a Force 12 EF-180-BV vertical tuned for CW. It uses four elevated radials, 10 ft. high. On 160m, I use an Inverted-V with the apex at 60 ft. I also have a ground-mounted Butternut HF9V-X multiband vertical and a 30m dipole at 30 ft.
On VHF, I have a 3-element Cushcraft A50-3S yagi on 6m and a Comet CX-333 vertical for 2m, 1.25m, and 70cm. I have done quite a bit of antenna modeling and terrain analysis of my QTH. My station is atop a hill at 1150 feet above sea level. This hill is quite a bit higher than the surrounding terrain. The results of my terrain analysis with N6BV's YT program are an interesting study in antenna heights. In many cases, my relatively low antennas are much better than if I had gone higher. The old adage that "higher antennas are better", is a myth. 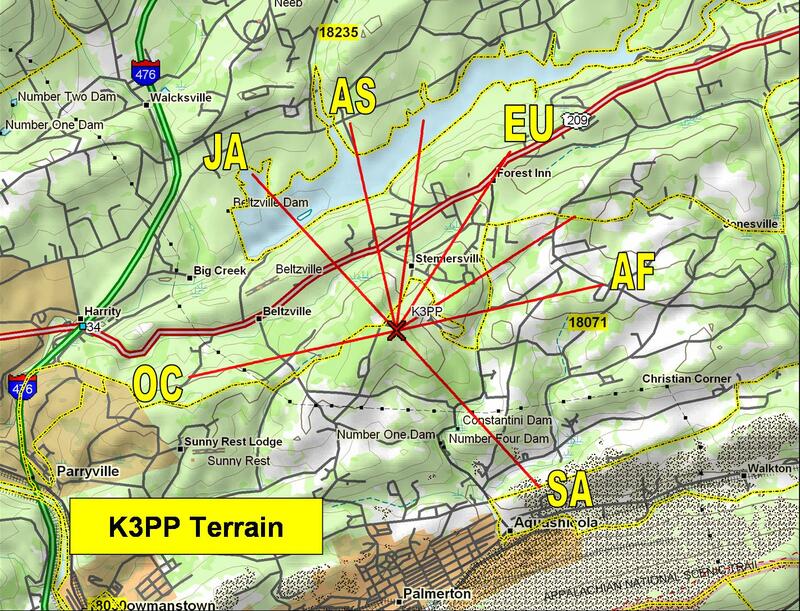 Click on the map to the right to investigate more about K3PP's terrain and the computer analysis performed on this terrain data. I am in the process of building a robust switching system to support operation with two simultaneous radios. In contesting circles, we refer to this as Single-Op Two-Radio (SO2R) operation. I have the technical design details worked out and I'm making good progress on the implementation. Now, I just need to train my brain to do this. THIS is the difficult part! Click on various sections of the diagram for more detail or click here for a larger version of the full diagram.